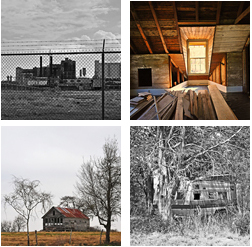 October, 2011 /Photography News/ Throughout our daily lives we pass by or see those structures and buildings that are left to decay. We are curious and intrigued. What is their history and why were they left behind? Some of the structures are plain and mundane while others reveal hints of having more elaborate architectural details. Send your best representations of abandoned structures for a chance to win cash prizes in the newest photography contest sponsored by Profotio. Submit up to 4 (four) images. Both black & white and color photos will be accepted. Interior or exterior images accepted.